Football season is in full swing! Go Bucs! (ok so they aren’t great, but maybe we will win a Super Bowl again one day!) So last Sunday I decided to make a bunch of appetizers to snack on during the games. One of my favorites was the spinach dip. 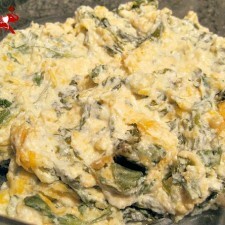 I am in love with spinach dip! I always have to order it at restaurants and I have finally figured out a good recipe to make it at home. Serve it with store-bought or our homemade tortilla chips and munch on it all day long today! 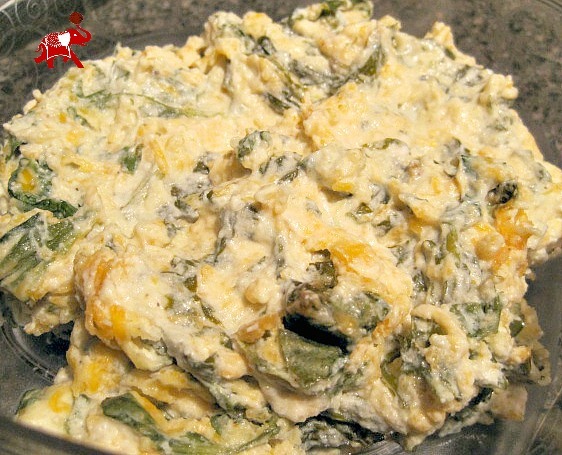 If you happen to have any leftovers, I don’t think you will, but if for some odd reason you do, I have a great way to turn the spinach dip into lunch tomorrow. Make sure you come back tomorrow to see my creation! Preheat oven to 350 degrees F. Melt coconut oil in large skillet over medium heat. Add spinach and cook 2-3 minutes or until wilted. Combine all ingredients in a large bowl. Spray 8×8 glass baking dish with non-stick spray. Transfer dip to baking dish and bake for 20 minutes or until hot and bubbly. Tip: This dip is great cold too! Leave a little out to snack on while the rest is baking! Check out some of our other great football foods: Buffalo Chicken Dip, Vegetarian Buffalo Wings, Boneless Buffalo Wings, Kale Chips, Turkey Meatball Skewers, Guacamole, plus many more!